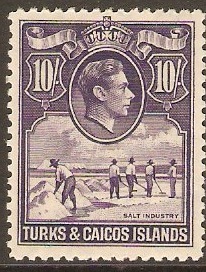 Home :: Turks and Caicos Islands :: Turks & Caicos Islands 1937-1952 :: Turks and Caicos 1938 10s Bright violet. SG205. Unmounted mint 1938 10s Bright violet. SG205. King George VI definitive stamp.